﻿ Fun Easy English - new american english idioms letter n.
In this lesson you will learn American English idioms beginning with the letter N. You will learn the definition and study the usage of each idiom. nail down make certain of I want to nail down the exact time that we will meet tomorrow. named after given the name of She was named after one of her cousins. name is mud reputation is ruined Your name is mud now that you were caught cheating on the exam. name of the game main objective The name of the game is to make money for the company. narrow escape barely avoided She had a narrow escape from injury when she fell off her bike. neck and neck nearly equal The two teams were neck and neck in the game. The expression is often used to describe what part of the country a person comes from, but it can also be used to describe unfamiliarity with a part of a city or state. It is frequently used in a negative structure. 1. I don’t recognize you and I know just about everyone in this town. You must not be from this neck of the woods. 2. Excuse me. Can you give me directions? I’m not familiar with this neck of the woods. needle in a haystack close to impossible Finding your earrings in this field is like a needle in a haystack. The expression, which comes from Yiddish, is ironic. One certainly wouldn’t want or need a hole in one’s head, and one wants or needs the thing in question just as little. 1. Bonita arrived at work to find a new stack of papers on her desk. “I need more work like I need a hole in the head,” she complained. 2. Don’t subscribe to another magazine, since you already receive more magazines than you can possibly read. You need a new magazine like you need a hole in the head. neither fish nor fowl not in a definite group This report is neither fish nor fowl and I am not sure where it should be filed. neither here nor there off the topic What he is saying is neither here nor there. nervous Nellie nervous person Try not to be such a nervous Nellie. nest egg amount of money saved He has a good nest egg in the bank. never mind Do not bother Never mind, I can do the laundry. new blood fresh energy The new employee sure has added new blood to this company. new deal complete change This business plan is certainly a new deal. new person person who has become better Since she lost weight she is a new person. nice out nice weather It sure is nice out today. nick of time last possible moment He got to work in the nick of time. nip and tuck evenly matched The two teams were nip and tuck until the end. The expression compares stopping a bad situation to cutting (nipping) a flower before it has a chance to grow (while it is still a bud). 1. My three-year-old son has become rude and demanding. I don’t like his bad behavior and I’m going to nip it in the bud before it gets any worse. 2. The boss wasn’t happy with a few of his workers who had begun to leave the office before quitting time. He was afraid they would fall into the habit of leaving early if he didn’t nip it in the bud, so he told them they would have to stop. Compare to: get down to brass tacks; bottom line; long and short of it 1. These conferences always begin with introductory speeches that don’t say much. I’m glad when they’re finished and the speakers get down to the nitty gritty—that’s when we really learn something new. 2. Let’s skip the small talk, and go straight to the nitty gritty: what price do you want for the car, and when will you be able to part with it? Synonym: give (something) the thumbs down 1. I thought it was an excellent idea, but he nixed it. Now we are back to where we started. 2. Every time I ask my parents if I can visit my cousins, they nix my request. They think my cousin is a bad influence on me. no bed of roses not easy Trying to work at two jobs is no bed of roses. nobody's home the attention is elsewhere If you talk to him you will realize that nobody's home. nobody's fool an intelligent and independent person She is nobody's fool. no cigar not agreed to He almost bought the car but in the end the sale was no cigar. no deal not agreed to He almost bought the car but in the end the sale was no deal. no dice no He wanted to borrow some money but she said no dice. no doubt no uncertainty There is no doubt which team will win this year. no end continually She cried no end after she lost her job. no end to no finish point There appears to be no end to this project. no go not happening The plans for this weekend are no go. no great shakes average The restaurant was no great shakes. no love lost ill will There is no love lost between them. no matter regardless of He cannot get good grades no matter how much he studies. NONE OF (ONE’S) BUSINESS private; not for anybody else to know 1. You keep asking me how much money I have, but I don’t want to tell you. It’s none of your business. 2. I wish my sister would stop asking questions about my personal life. It’s none of her business. no picnic difficult This new job assignment is no picnic. no problem okay It's no problem if you bring your friend to the party. nose about look for something kept private The secretary tries to nose about his desk when he is out. nose around look for something kept private The secretary tries to nose around his desk when he is out. no show absent I think that she will be a no show. no sweat okay It's no sweat to finish the report on Monday. no sweat easily accomplished Installing the new light in the kitchen was no sweat. Having a leg to stand on lends support to something, and not having a leg to stand on means support is lacking. 1. Some of the workers accused Louis of stealing from the company, but they didn’t have a leg to stand on. He had never stolen from the company and they had no proof that he had. 2. Stop trying to persuade me that you didn’t start the fight. You don’t have a leg to stand on. All the children saw the whole thing, and they told me exactly how it happened. Antonyms: something to crow about; a feather in one’s cap. The expression originates from the idea that if one were writing a letter to one’s family, the person or thing or event in question is so ordinary or insignificant that one wouldn’t even mention it in the letter. 1. Tom’s parents wanted to know how he liked the school. Tom said the school was all right, but it was nothing to write home about. 2. When we asked them about their trip, they said they couldn’t complain about it but the hotel was nothing to write home about. The expression is usually used in the negative. 1. I like going to parks and doing things outdoors. Going to museums and galleries just isn’t my cup of tea. 2. The man JoAnn met at the party was nice, but he wasn’t her cup of tea. This expression is always used in the negative. 1. Scott thought that he could sell his collection of comic books to make some extra money, but then he learned that everybody else already had the same comic books. His collection wasn’t worth a dime. 2. Police caught the diamond thief when he tried to sell a fake diamond. It was not worth a dime. not give someone the time of day not give her any attention I would not give her the time of day. nothing doing not possible Nothing doing. I am not working late tonight. nothing if not certainly He is nothing if not punctual. nothing to sneeze at something that should be taken seriously The new business plan is nothing to sneeze at. not much of a not a good It is not much of a car, but it works. not on your life definitely not You want to borrow the car. Not on your life. not so hot not good She has been feeling not so hot lately. not touch something with a ten-foot pole not want involvement with that car I would not touch that car with a ten-foot pole. This expression is always used in the negative. 1. If you don’t follow through on what you say, your word is not worth a hill of beans. 2. You should take good care of that car. If it stops running properly, it’s not worth a hill of beans. This expression is always used in the negative. 1. The millionaire invested in oil wells that proved to be dry. They weren’t worth a plugged nickel. 2. I bought this house before I knew it was located on a toxic waste site. Now it isn’t worth a plugged nickel. This expression is always used in the negative. 1. That coupon is expired, so the grocery store won’t accept it. It’s not worth a red cent. 2. A telephone directory from thirty years ago isn’t going to help you find what you need. It’s not worth a red cent. This expression is always used in the negative and usually refers to documents or money, i.e., things printed on paper. 1. If you miss the train, you can’t just go at another time. Your ticket won’t be worth the paper it’s printed on. 2. Make sure you spend or exchange all of your money before we leave this country; once we leave, it isn’t worth the paper it’s printed on. now and then occasionally She likes to go to that restaurant now and then. no way not possible No way to fit all those things in that purse. no wonder not surprising Since he stayed up all night, it is no wonder that he is tired. number cruncher person who works with numbers The owner of the company has always been a good number cruncher. number one oneself Always looking out for number one is not the best idea. nurse a grudge keep a feeling of dislike She will probably nurse a grudge towards her old boss for years. nuts about enthusiastic She is really nuts about watching movies. nutty as a fruitcake crazy The woman who lives next door to us is as nutty as a fruitcake. Hey do you know any English idioms beginning with the letter N not listed on this page? 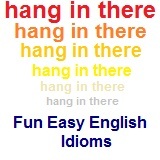 Then post a comment below and add your idioms to Fun Easy English.